Today I had major cravings for heavier foods — cooked food, high-fat foods, just about anything. I wanted something more substantial than just fruit and veggies. It was harder than usual to stick to eating mostly fruit today. My 30-minute aerobic workout at the gym seemed considerably easier. When my pulse was 150 beats per minute, it felt more like 120-130. My breathing also seemed slower and more relaxed. I felt very energetic the whole time. My weight dropped another 0.4 pounds to 181.2. Total weight loss is 4.8 pounds in 8 days. I still like these simple breakfasts. They’re great after a workout and shower and take only minutes to prepare. I felt unusually hungry this morning, even after a decent breakfast, so I made this avocado boat and snacked on bananas. This was filling enough that I didn’t have lunch until 2pm. I made the dip using a full avocado, but I ate only half of it and saved the rest. So the amounts I recorded above are for what I ate. I’ll record the rest of the dip when I actually eat it. 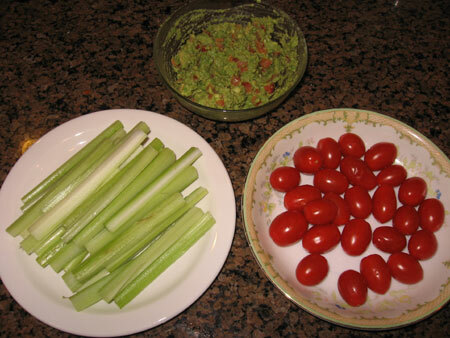 I used the dip for the celery sticks and ate the grape tomatoes on the side. I’m amazed by how easy it is to create halfway decent dressings and dips with no oil, no spices, and only a handful of ingredients. I ate 2 more bananas (250g). This is the first time I used raspberries in one of these smoothies. It worked really well. I expect to make more smoothies with raspberries. The only downside is that because of their seeds, they can make the smoothie a little gritty. I ate 2 tangelos (224g). I pushed the fat a little higher today by eating 1.5 avocados, but it wasn’t excessive considering the total calories. I am finding it pretty challenging to keep the fat near 10%, but my main goal is just to keep the weekly average below 15%. Due to the cravings, today took a bit more willpower not to overeat fatty foods. 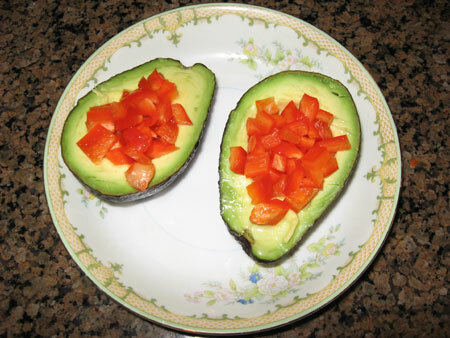 The avocados were really good, and I could have easily eaten more of them. After the first avocado though, I felt so sleepy I had to lie down and take a nap. A few people who were doing this experiment with me already dropped out. This diet may look deceptively simple, but it can be a real challenge if you’ve never done it before. On my first trial of eating raw in 1997, I only lasted 3 days, and I was constantly hungry. On difficult days like today, I take full advantage of the 30-day trial concept and tell myself, “I can eat whatever the heck I want on January 31st.” And I mean it when I say that. I’m totally committed to making it to the end of the 30 days eating 100% raw, but beyond that I know I’m free to make a different choice. This makes it easier to keep going with the trial without feeling trapped. I’ll be in a better position to consciously decide what I want to do long-term after I have 30 days of success behind me. So far every time I’ve done a trial of a raw diet, I always decided to return to eating cooked food. But this is the first time I opted to try the low-fat raw approach.